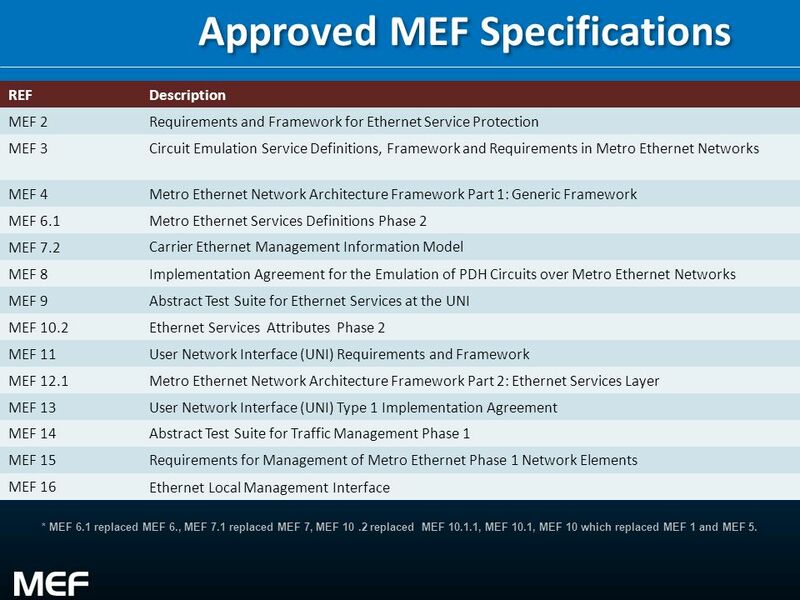 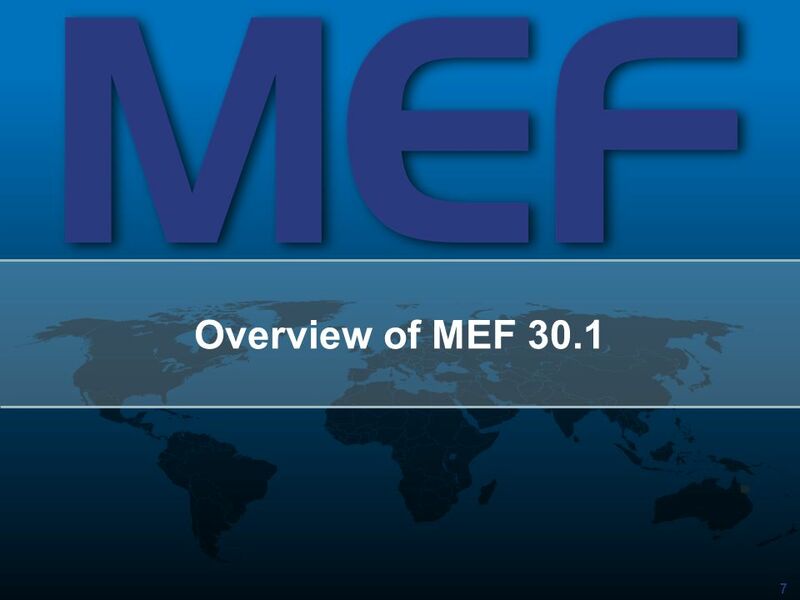 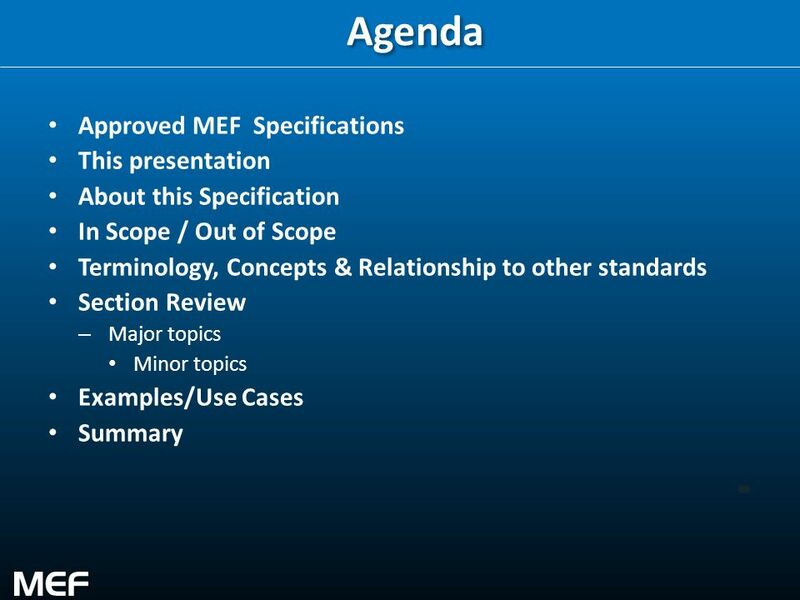 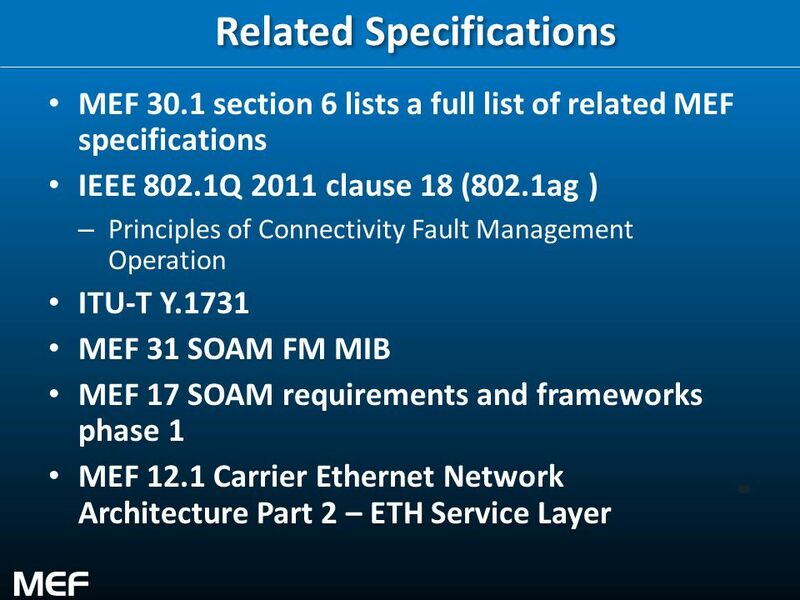 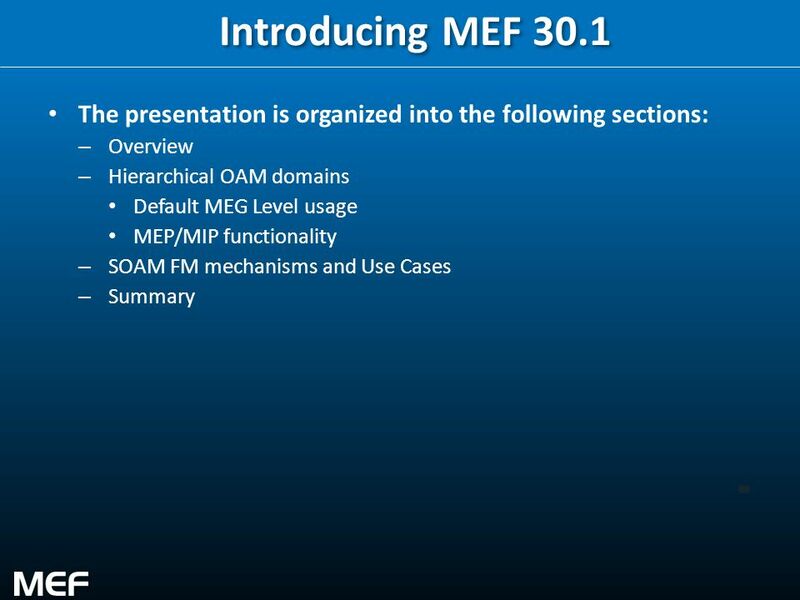 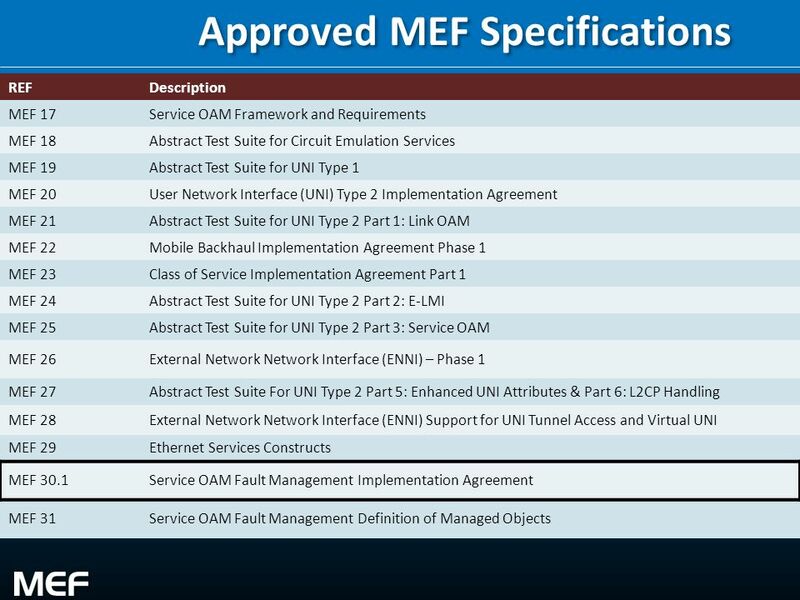 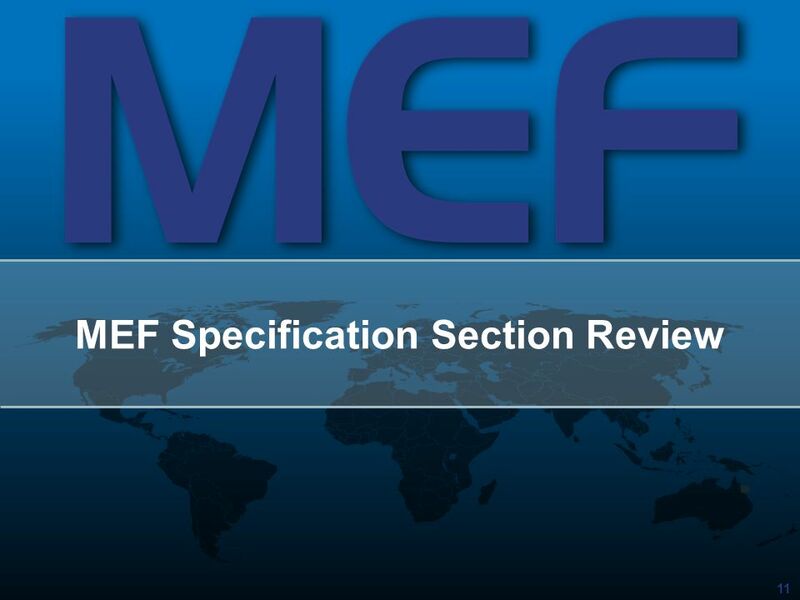 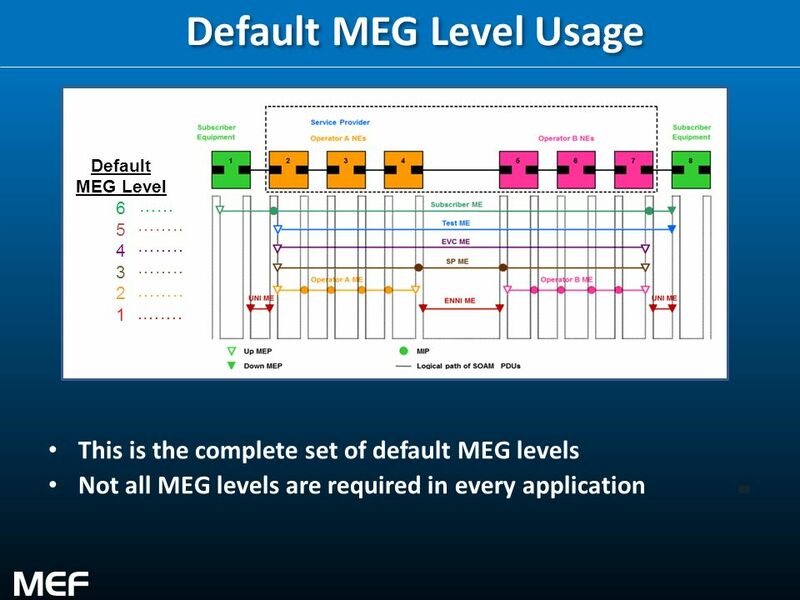 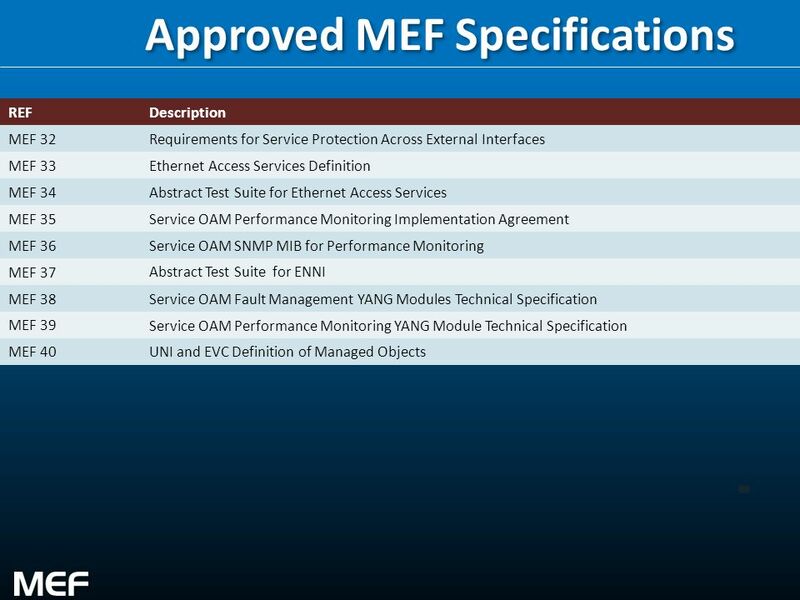 REF Description MEF 2 Requirements and Framework for Ethernet Service Protection MEF 3 Circuit Emulation Service Definitions, Framework and Requirements in Metro Ethernet Networks MEF 4 Metro Ethernet Network Architecture Framework Part 1: Generic Framework MEF 6.1 Metro Ethernet Services Definitions Phase 2 MEF 7.2 Carrier Ethernet Management Information Model MEF 8 Implementation Agreement for the Emulation of PDH Circuits over Metro Ethernet Networks MEF 9 Abstract Test Suite for Ethernet Services at the UNI MEF 10.2 Ethernet Services Attributes Phase 2 MEF 11 User Network Interface (UNI) Requirements and Framework MEF 12.1 Metro Ethernet Network Architecture Framework Part 2: Ethernet Services Layer MEF 13 User Network Interface (UNI) Type 1 Implementation Agreement MEF 14 Abstract Test Suite for Traffic Management Phase 1 MEF 15 Requirements for Management of Metro Ethernet Phase 1 Network Elements MEF 16 Ethernet Local Management Interface * MEF 6.1 replaced MEF 6., MEF 7.1 replaced MEF 7, MEF replaced MEF , MEF 10.1, MEF 10 which replaced MEF 1 and MEF 5. 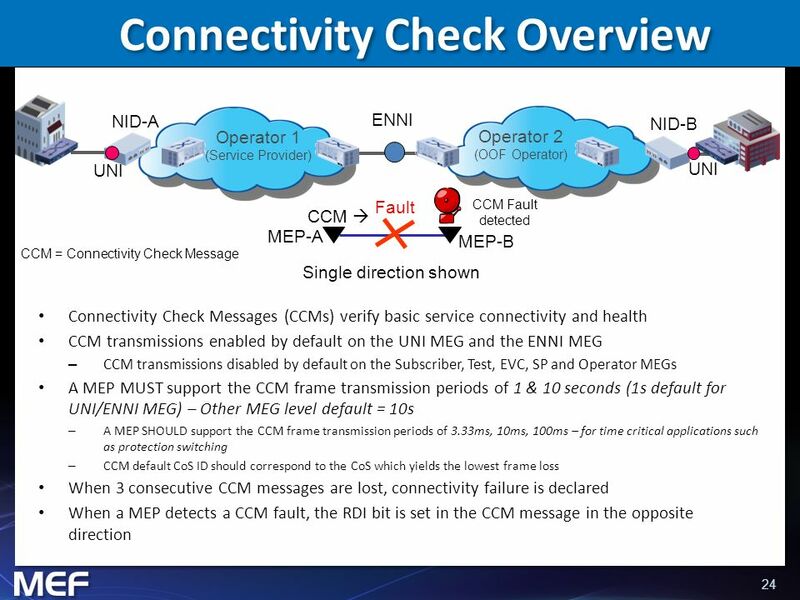 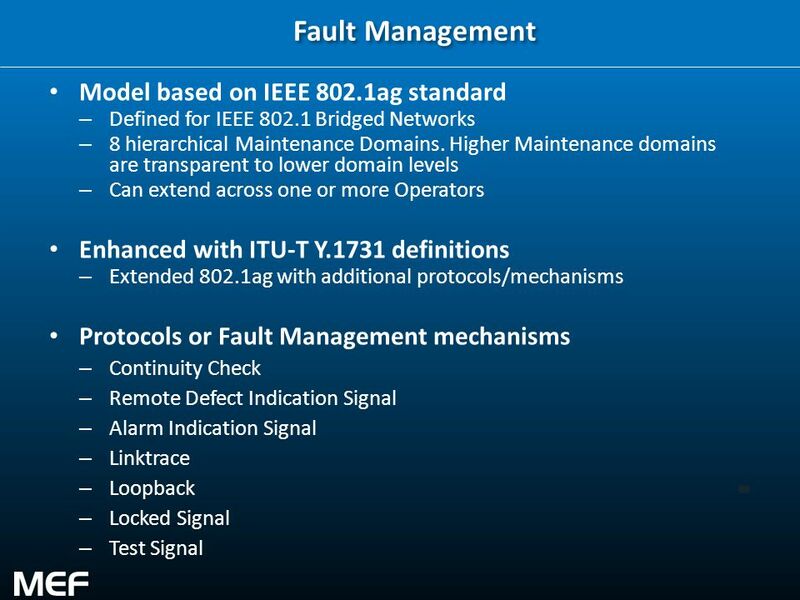 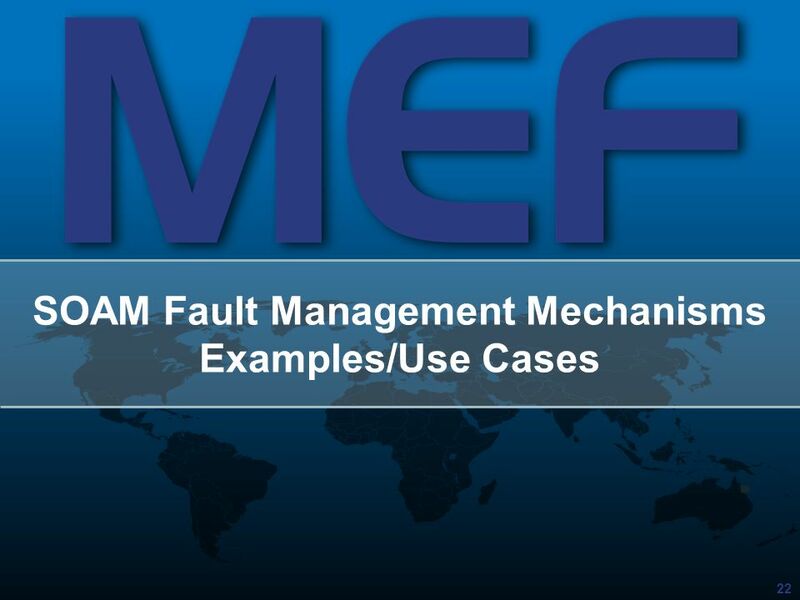 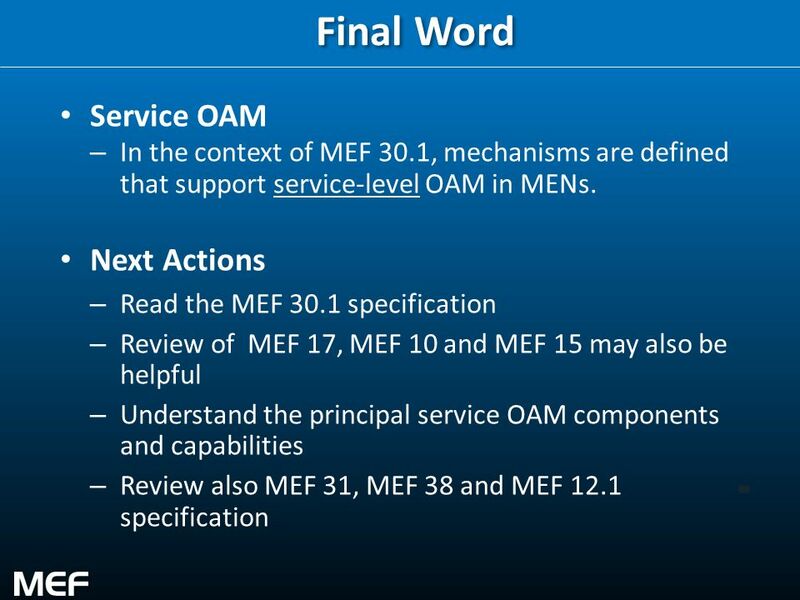 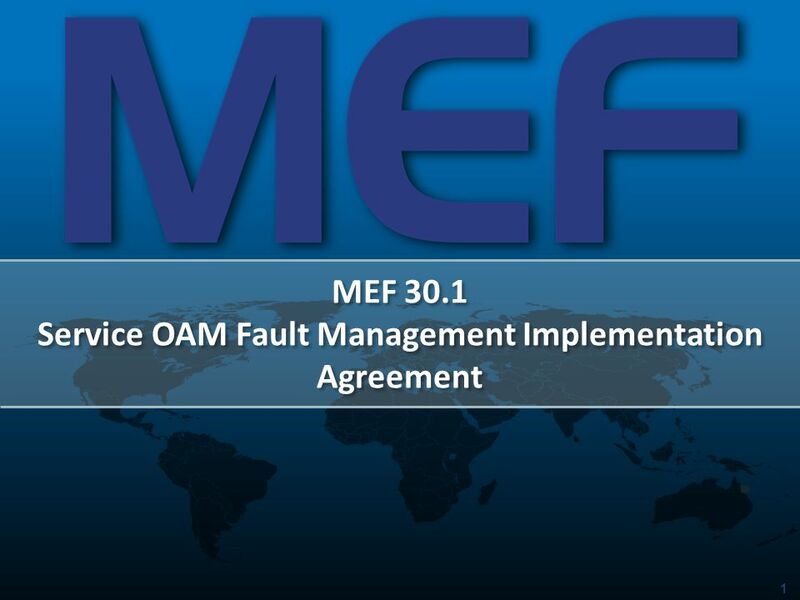 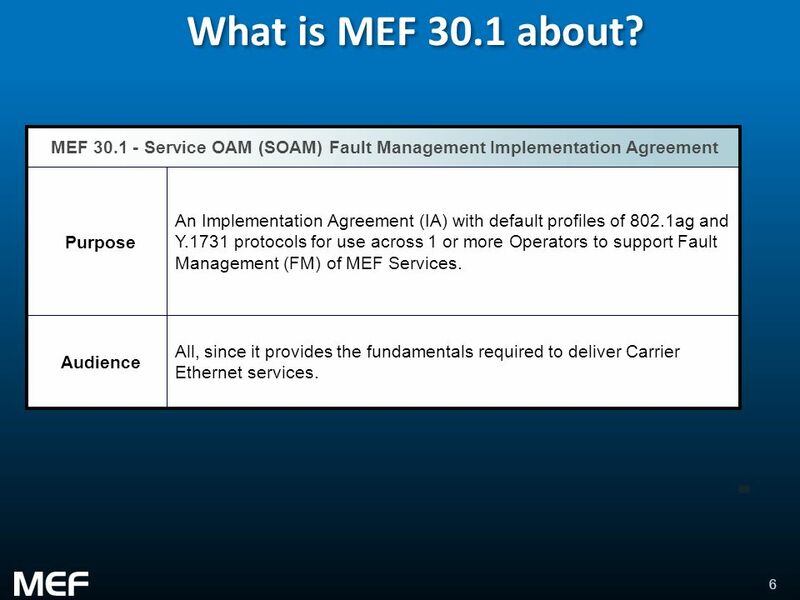 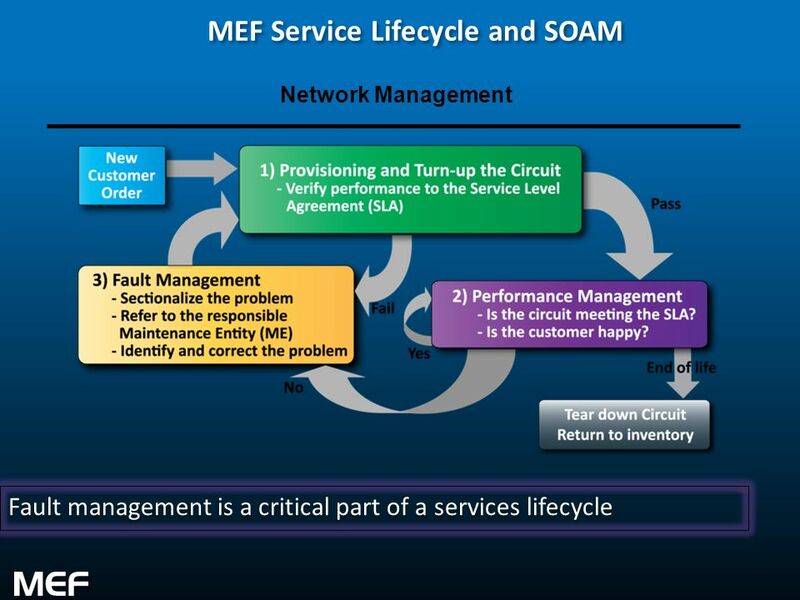 Download ppt "MEF 30.1 Service OAM Fault Management Implementation Agreement"
McGraw-Hill©The McGraw-Hill Companies, Inc., 2003 Chapter 3 Data Transmission. 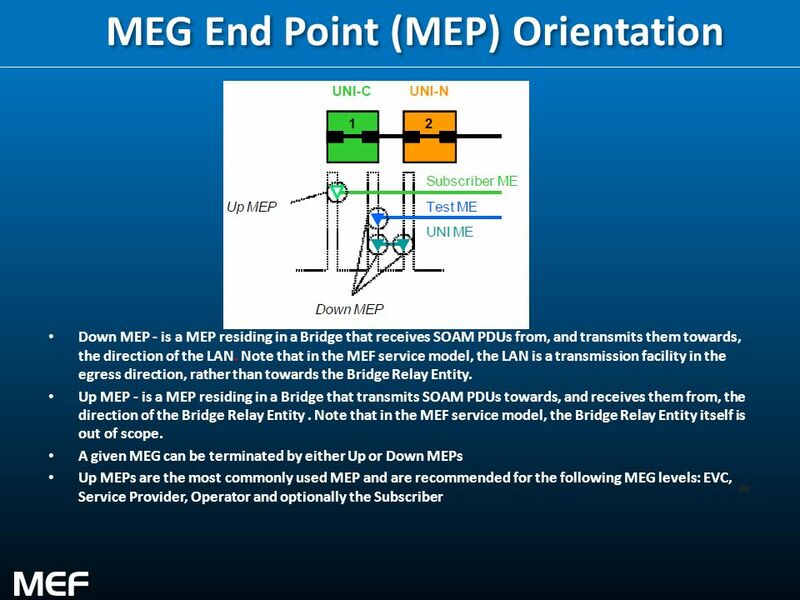 McGraw-Hill©The McGraw-Hill Companies, Inc., 2003 Chapter 11 Ethernet Evolution: Fast and Gigabit Ethernet. 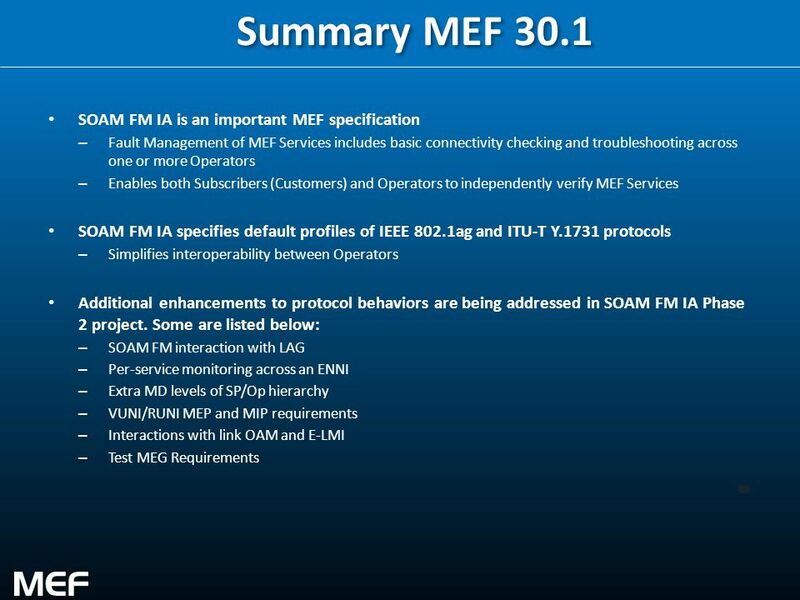 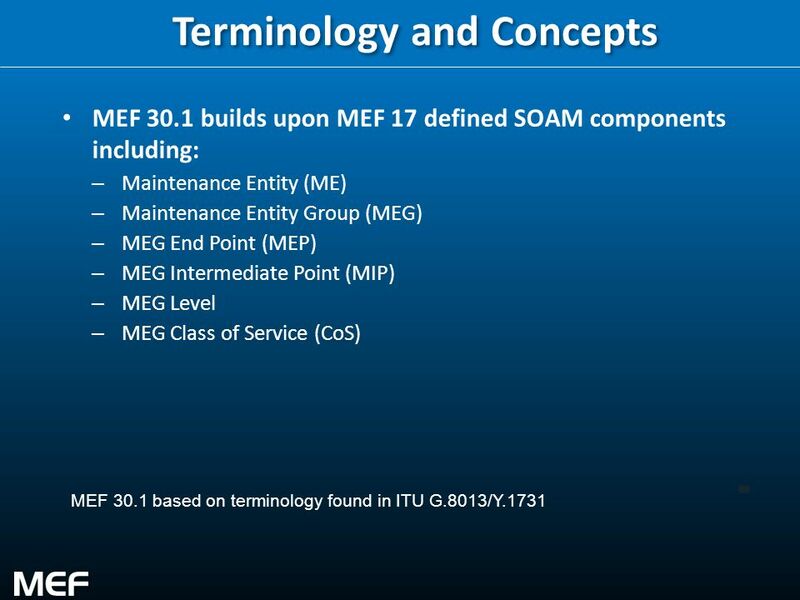 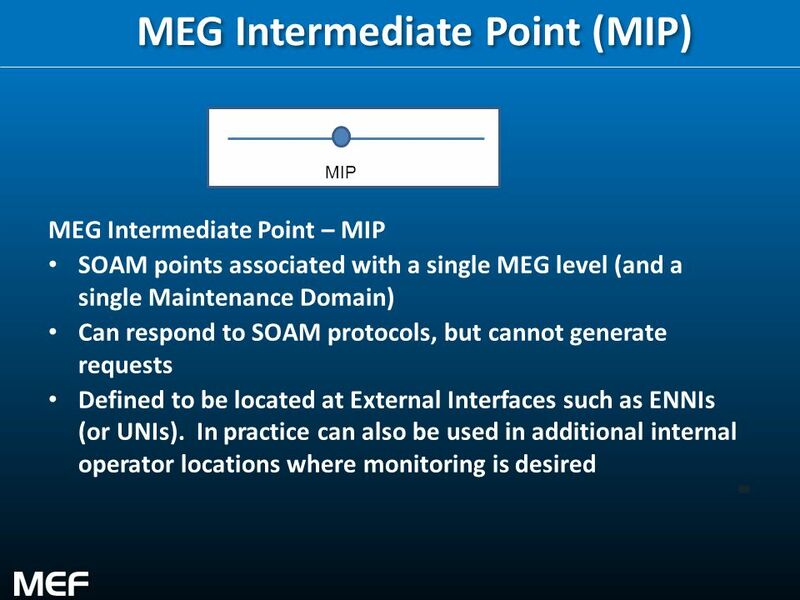 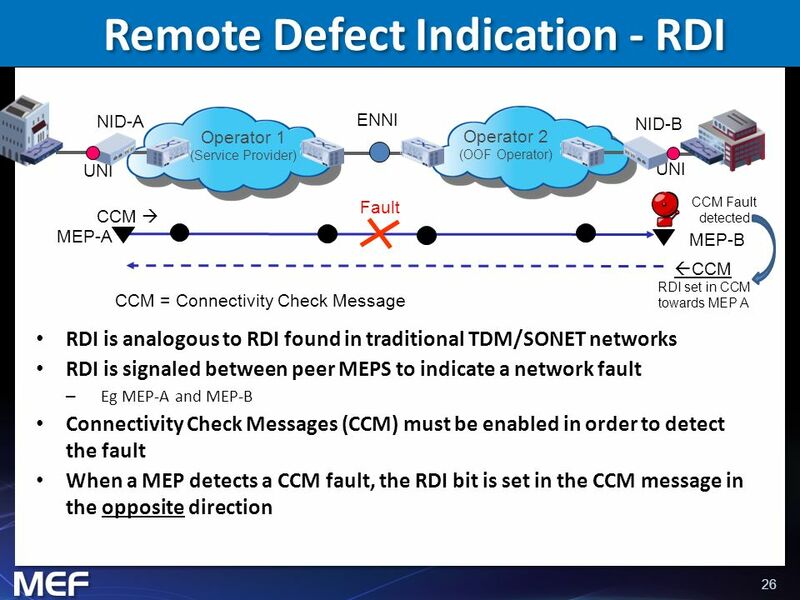 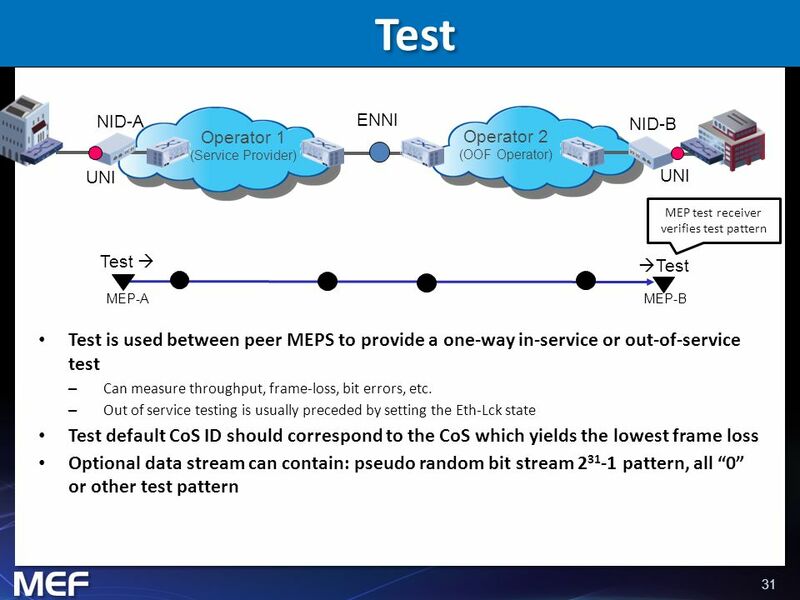 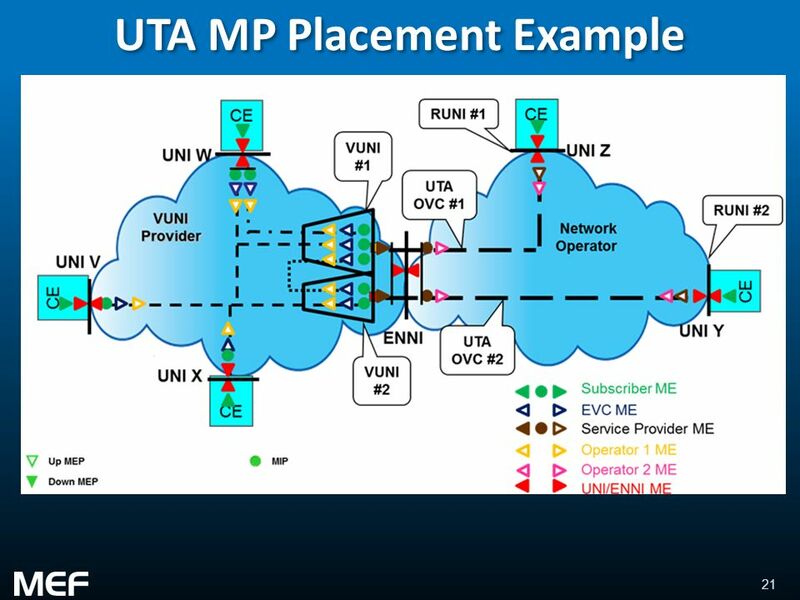 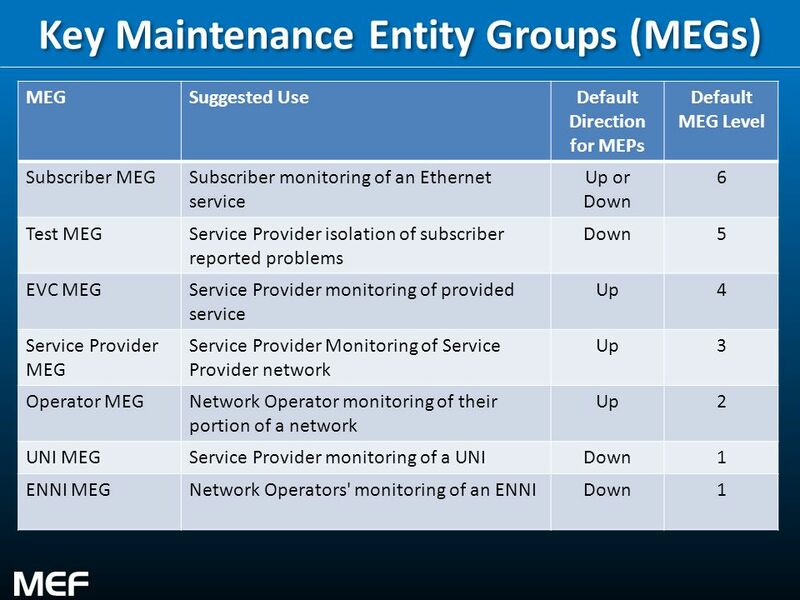 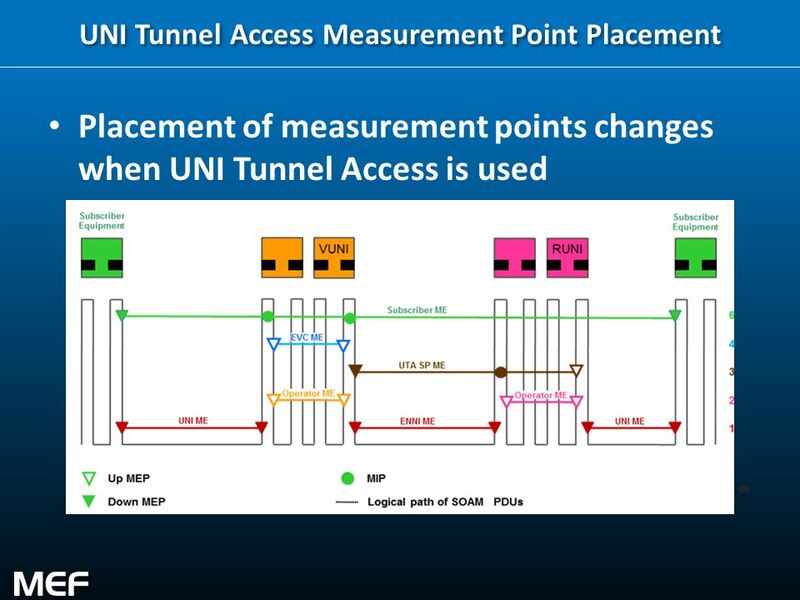 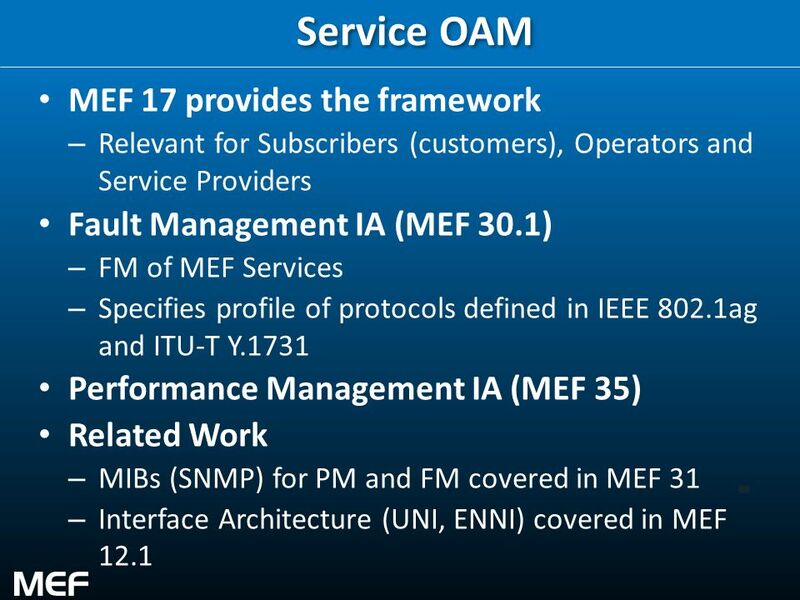 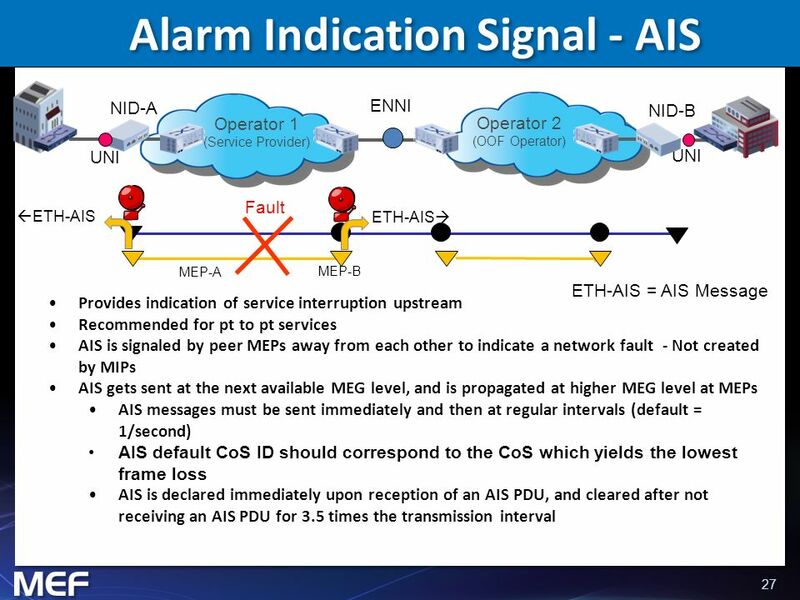 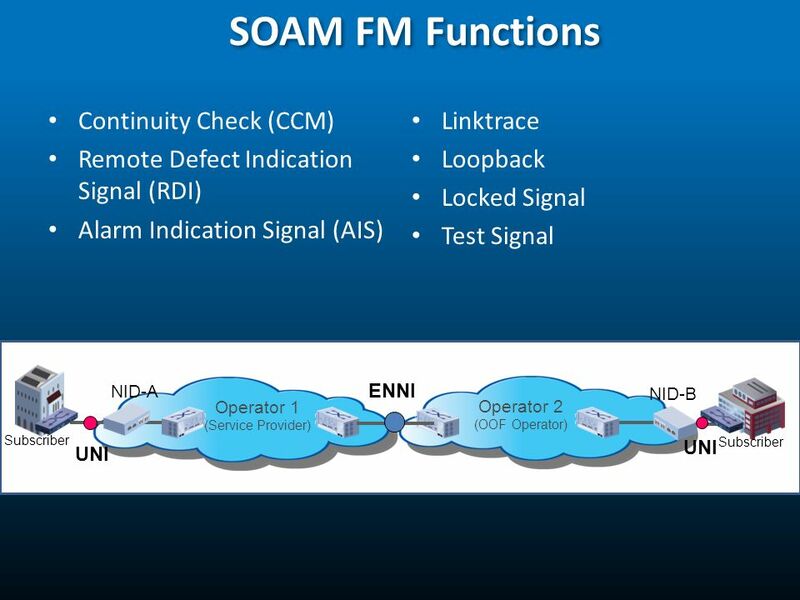 PAR for Media Converters r2IEEE interim, October, PAR for Media Converters revision 2 Norman Finn Cisco Systems. 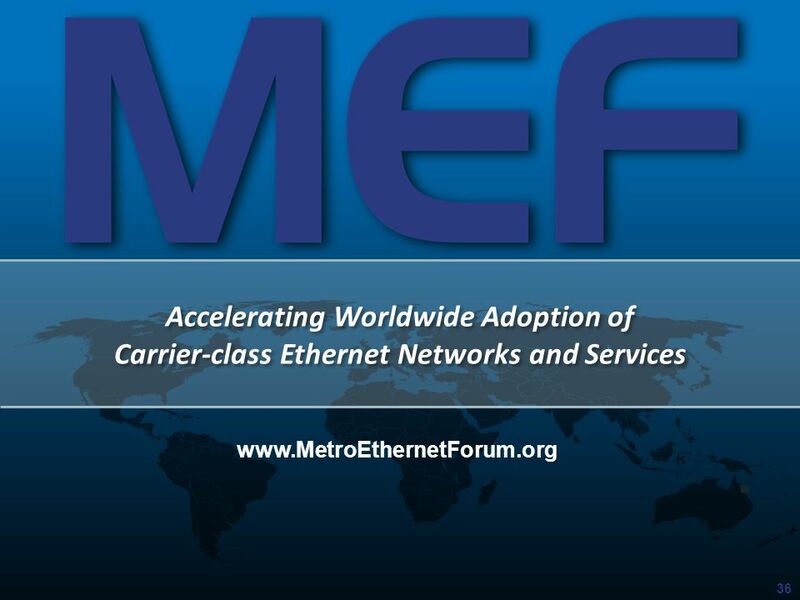 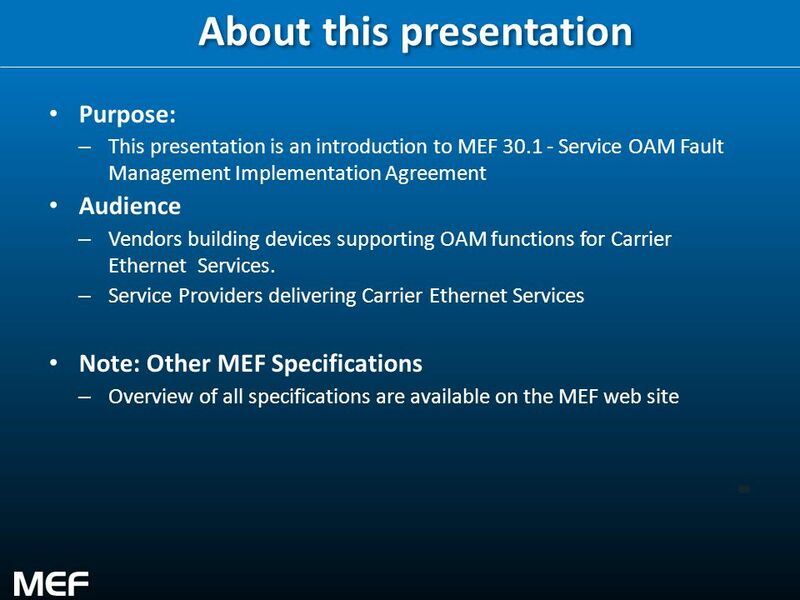 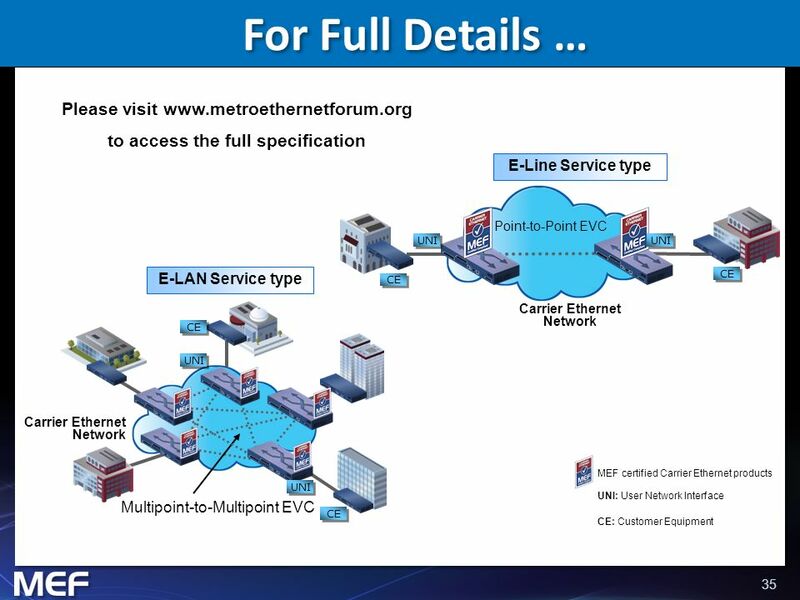 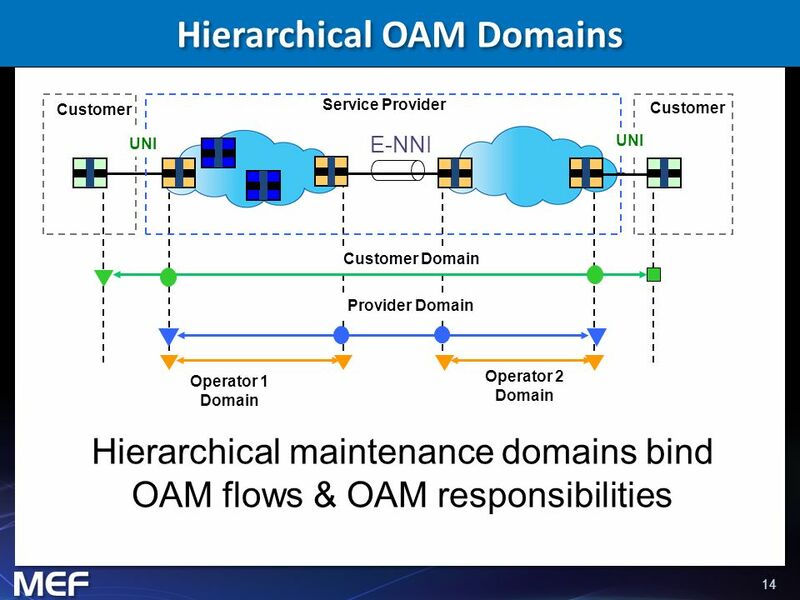 1 Metro Ethernet Forum OAM An Update Matt Squire Hatteras Networks. 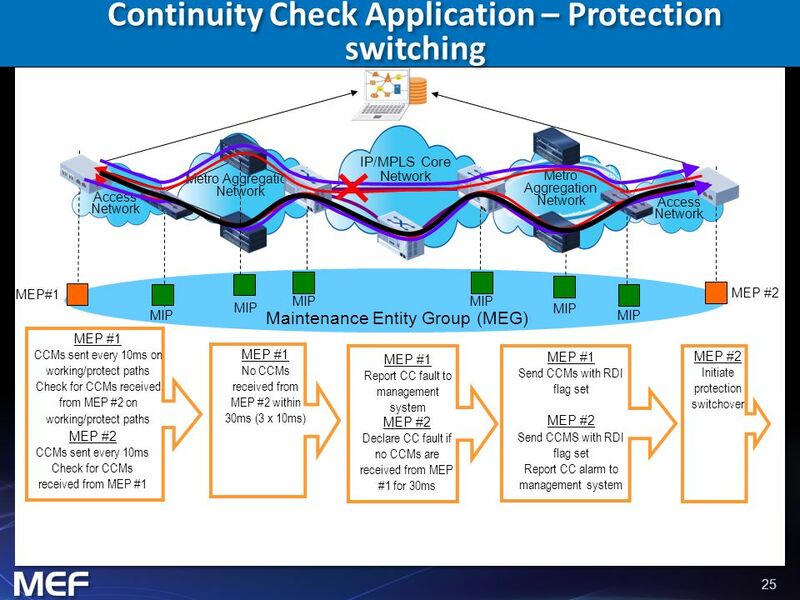 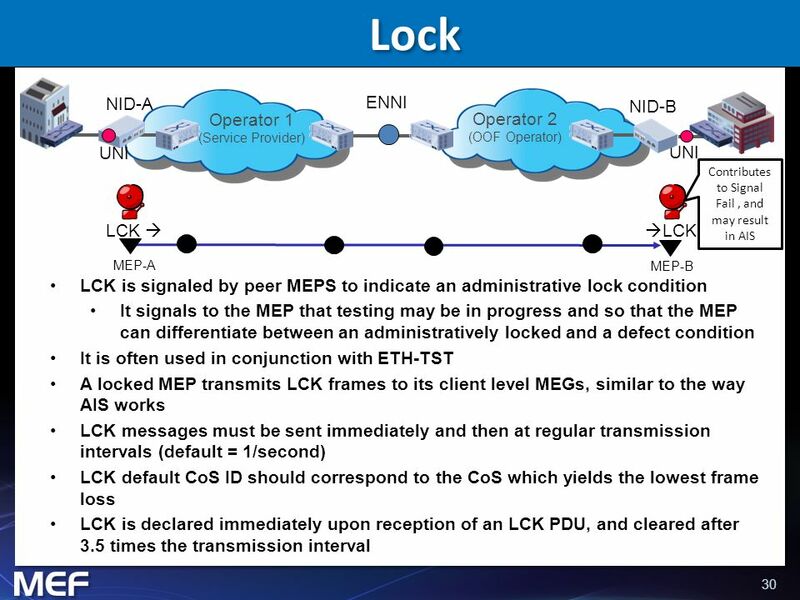 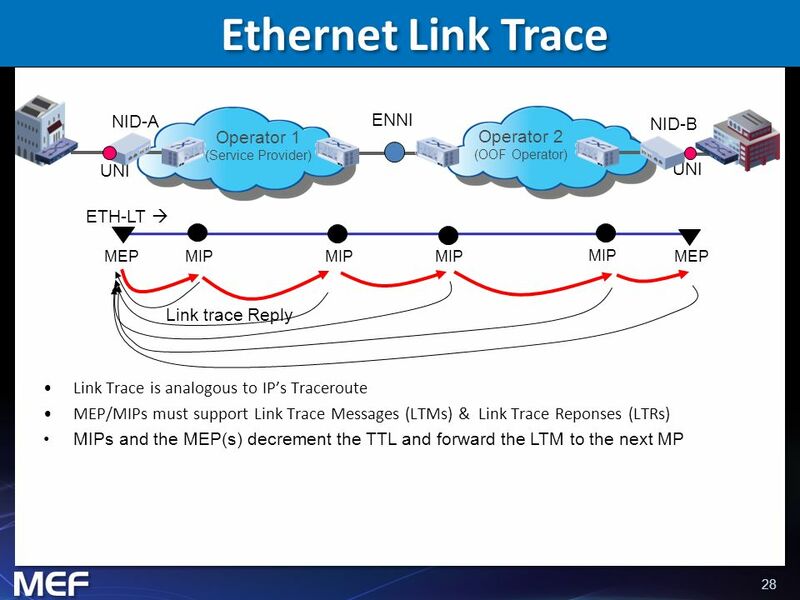 Nortel Confidential Information 1 MPLS & Ethernet OAM Interworking (draft-mohan-pwe3-mpls-eth-oam-iwk) L2VPN WG, IETF-71 (Philadelphia) Mar 13, 2008 Dinesh.